Wherever you find Orcs in the Khanate you will find their physically weaker and smaller kin the Goblins. But don’t let their stature fool you, the cunning that is attributed to Orc tribes, clans and kin-bands comes predominately from the goblins living within them. 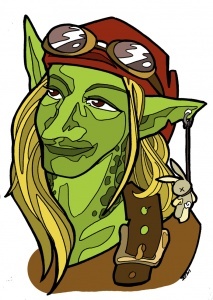 Then there is the one clan of goblins that is very different from the rest of the tribes; the Tinker Clan. These goblins learnt early on that the best way to survive in orc culture was to be useful and terrifying. This eclectical collection of crafters have interesting views on invention, safety, and research process. It is rare to find them unmarked by their experimentations. The tinker stronghold in the south; the Pit, is the most wretched hive of scum and villainy that few outside the goblins are willing walk amongst the filth and gloom. Green skin, part mask, large pointy ears. Goblins from The Hobbit, Redcaps from English folklore.